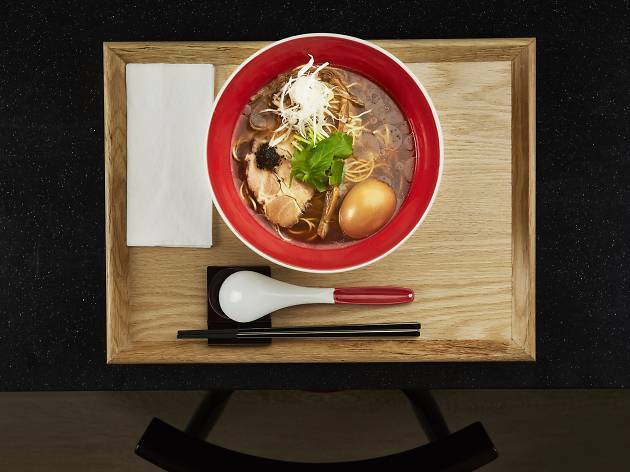 In 2015, Tokyo restaurant Tsuta became the first ramen joint in the world to be awarded a Michelin star. Following a successful launch in Singapore, Tsuta has come to our shores and landed in Causeway Bay’s V-Point. The Hong Kong outpost has a lot to live up to but expertly delivers. When I arrive, the waiting line is an hour-long – mercifully shorter than the five hour queues that have snaked outside its flagship branch in Japan. As is practice in their Japanese restaurants, Tsuta Hong Kong prepares only 400 bowls per day, so get in early to avoid disappointment. It’s the quality of ingredients that sets Tsuta apart in the ramen world. The stock (dashi) is MSG free and made with whole chickens, fresh clams and dried fish, all simmered for nine hours before a blend of three different soy sauces is added. One is chef Onishi Yuki’s personal blend and the other two are custom-brewed in Japan’s Wakayama Prefecture using two-year matured whole soybeans. The final touch is the addition of a specially made truffle sauce and oil, a smell that greets the nose immediately upon entry. The restaurant is shiny, sleek and minimal, seating around 20 in front of an open kitchen. 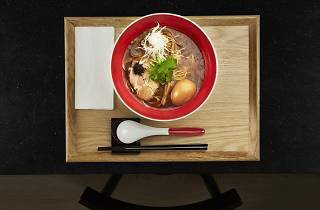 I order up the ajitama char siu shoyu soba, the restaurant’s signature ramen. Though light in appearance, the broth is layered with umami and a depth of flavour I’ve never encountered in ramen, mostly due to the truffle. The noodles were wonderfully al dente and the cha siu intricately marbled with fat. The pork is almost pastrami-like in flavour and whilst strong when eaten alone, it marries well with the truffle-laden soup. The bamboo shoots are satisfyingly peppery and the egg cooked to creamy perfection. The absence of MSG completes the happy experience. The fare at Tsuta is a world away from your average ramen joint. This is a clean, quality bowl of ramen with a stock that, although possibly a little too truffle-heavy for some, is worth the wait. Only avoid if, like Anthony Bourdain, you think truffle oil is as inedible as lube. If you’re not in that class, you’re in for a treat.